I didn't really want to write this post as I wasn't sure that anyone would bother to read it and try to understand it. But eventually someone have asked me about it, so here I am. Родовий (Genitive) - shows relationship or possession. Давальний (Dative) - shows direction or recipient. Орудний (Instrumental) - using which thing? In order to be the master of declension of Ukrainian nouns you should know about different declension groups. There are four of those. neuter nouns that end in "о", "е" or "я"
But if you think that's all, oh how wrong you are. There is also such thing as hard, soft and mixed groups. These are like subgroups for nouns of first and second groups. 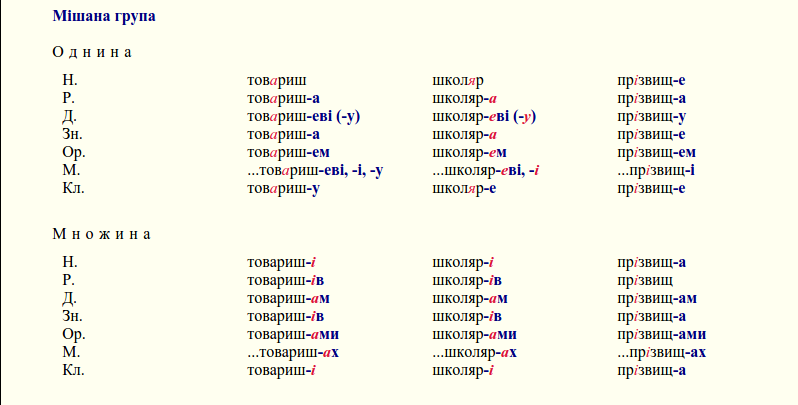 neuter nouns that end in "e", "я"
Sibilant consonants in Ukranian are: ш, ч, ж, дж. . This also includes letter щ which is a combination of 2 consonants: ш and ч. Now that you have mastered all of those pretty exciting things, here are some even more exciting patterns that you can follow when declining any noun you like. Дуже дякую. Це дуже корисно. Questions, remarks, corrections, constructive criticism are much welcome and appreciated. Thanks. The charts are useful. I'm afraid of frightening people even more by expanding them, but the main thing I can see which is missing is a discussion of which prepositions require which cases. You've included that for на and у, but not for the others. Oh, okay. I may just write a comment about it. Молодчина! Сильно. Хоча, можливо, для початківціві все це занадто складно. :) Якщо зірки запалюють, значить це комусь потрібно :) Я впевнений, що ваша робота не даремна і комусь-таки обов'язково знадобиться. До речі про росіян. Може, створимо курс української для російськомовних? Як гадаєте? :) І так, дякую за пост: я не можу бачити діаграм, але текст дійсно крутий! Я вважаю, що хто хоче, той розбереться, тим паче, що можна запитати, якщо щось не зрозуміло :). Well...this is about as confusing as ever could be. I won't lie, I understood next to none of it so far, but it certainly explained why I've been confused in the lessons. I'll refer back to this, then. Printing this out so I can reference it easily! Thanks for writing it out! Thank you for taking the time to write this post! It is very helpful! This is why I prefer Duolingo to formal language education. When I studied Russian in college I could never memorize all the charts I needed. I think Duolingo's use of positive reinforcement makes it easier to internalize the rules of the language over time. The idea of the charts isn't really to memorise them, but rather to have something to refer back to when you can't figure out why something you've just seen or read is correct, or why something you've just written or said is incorrect. They're organised to make it easy to find the particular form you're looking for rather than to make them easy to read through from beginning to end. Exactly. It would be great if Duo had some button or pulldown or other "repository" to place rules like these, to make it easier to refer-back and check on a mistake. 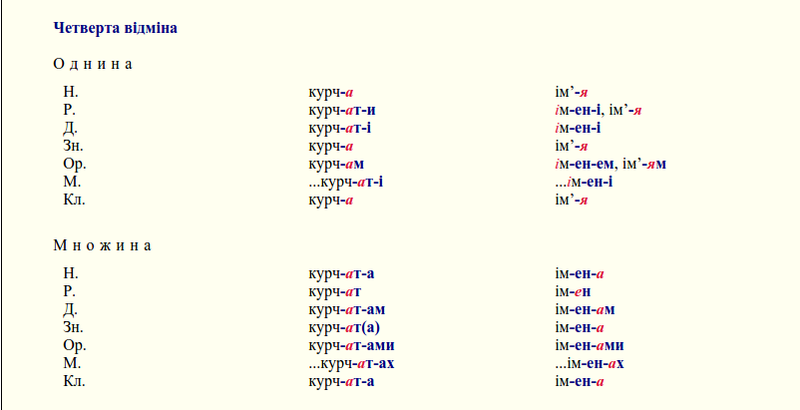 It's like learning Latin all over again, except the pronunciation is weird and it's written in Cyrillic. When I studied German in school, the teacher gave us a 'megachart' to help with noun and adjective endings by case. This looks to be every bit as helpful, without the uncertainty that comes with German gender. Спасибі! Just a quick question about the word "секретар" (second soft group). Should the ending -ю of Dative be stressed or not? Because it is not stressed here. And by the way, is this ending really not used nowadays, being completely replaced by -ові? The linguists suggest that if you have two consecutive masculine nouns in dative you use -ові for the first one and -у/-ю for the second: Андрієві Олексійовичу, товаришеві Бондаренку. One of the biggest problems I'm finding with the Duolingo approach is that we only see a new noun in its nominative case a couple of times before we start using it in other cases. Then, when I have to choose between two cases, I can't remember which one is the nominative case. (Sometimes, they're so different, I don't even realize they're the same word!) This list might help me to at least recognize the cases, even if I can't remember how to form them. One more comment: Before seeing this list, I had assumed that, like Spanish, words of particular genders had particular endings, with maybe a few exceptions. It seems like there is so much overlap of endings in Ukrainian that there's no way to tell the gender of a noun by its ending. You just have to know. I have a question about hard/soft consonants. 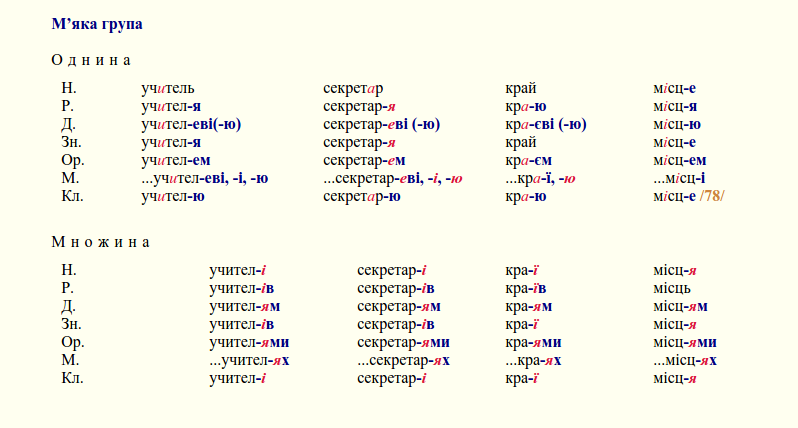 According to Ian Press' "A comprehensive grammar", ш is considered a hard consonant when followed by -а. 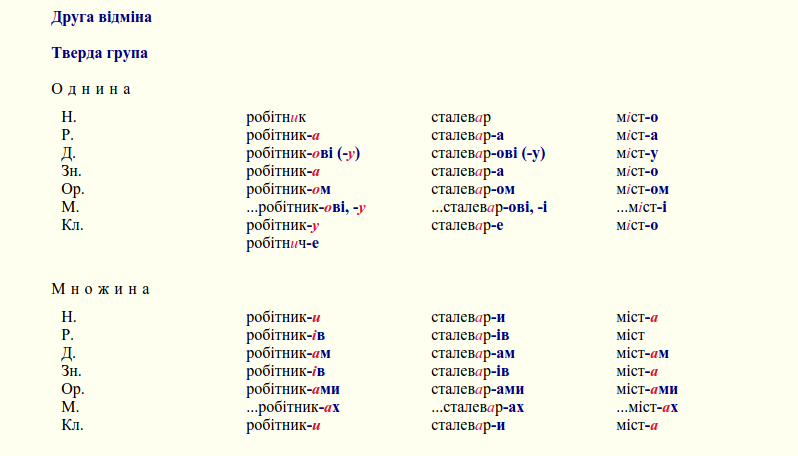 However, words like миша or душа decline following the soft or the mixed patterns of the first group. Is there a way to always tell the kind of consonant (ie. hard, soft or mixed) that the stem of a feminine word of the first group ends with, if you have never heard that word before? (This is making learning much harder for me, I'm trying to read books). You need to distinguish between hard/soft consonants and hard/soft/mixed groups. Groups are for words, not consonants (the rules for groups are in the post). Than all consonants can be either soft or hard, that depends on the letter after them. If it's А, Е, И, О, У, apostrophe or another consonant, your consonant is hard. 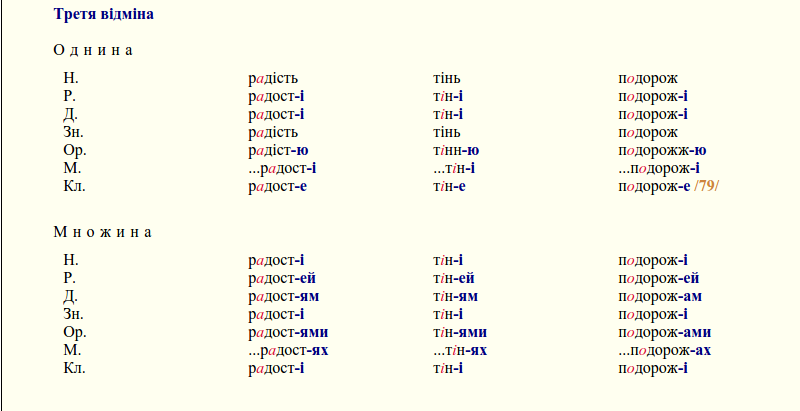 Then all consonants have different groups depending on the manners of articulation (not just in Ukrainian, any language has it). You don't need to bother with the majority of those, one group that should interest you in relation to declension is hushing sibilants: ш, ч, ж, дж. So is Ш hard when followed by A? Of course it is. Is it sibilant? It's always sibilant, that's just about the way it's pronounced, you make some hissing sounds when pronouncing it. That's why it follows mixed group. I was finding the Duo way frustrating as it didn't explicate the patterns. I know that probably works for non-linguists but I've learnt a lot of this from other (classical) languages so it helps me relate it to what I already know. Thanks, I think. It's a frustrating subject to learn, largely because all the explanations and charts one can find online disagree with each other, are badly translated, are missing important contexts and have only partial information. I guess that's because instructors try to simplify the subject. One result is charts that do not include plural versions and others that ignore gender. One tries to make it user friendly by saying each case "answers a question." But, the question words are confusing, for example "кого?" is the question for two different cases. Thanks for providing this thorough information. I haven't tried to study it all yet, but it seems like it's better to have ALL the information in a chart like this, than "simplified" versions. The subject should be turned over to a good graphic designer. who could organize it as a wall chart.